Is the graduate jobs market finally beginning to recover from the recession? The answer appears to be a qualified yes. A report published this month says that ‘2010 has seen a small but encouraging turnaround,’ and suggests that graduate employment is beginning to recover from the impact of the economic downturn, although it is still not back to pre-recession levels. 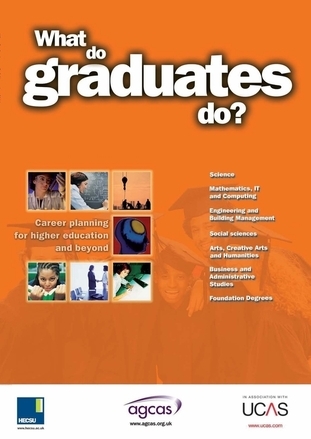 The report, What do graduates do?, analyses what 2010 graduates were doing six months after graduation, and finds that growth in the business and financial services has created more opportunities for recent graduates. This appears to have softened the impact of the early stages of the government’s cuts in public spending. Current students who are worried about their job prospects should think about developing their employability skills – skills such as teamworking and problem-solving – through work experience, volunteering and getting involved in extracurricular activities on campus. Posted in Miscellaneous and tagged destinations, graduate jobs, graduates. Bookmark the permalink. Win big prizes from big recruiters! There are 12 Awards up for grabs to identify the top undergraduates in IT and Computer Science, Management, Law, Arts and Humanities, Business and Finance, Engineering, Social Sciences, Construction, Engineering and Design, Low Carbon, Accountancy and Economics plus two special awards: the ‘Future Business Leader’ Award open to students from any discipline and the ‘First Year’ Award open to undergraduates from any course who have just started their second year. The rewards are great: winners’ prizes include laptops, internships and all-expenses paid trips to New York, South America, Florida, South Africa and continental Europe and the final ten students in each Award will be invited to the Undergraduate of the Year Awards in Canary Wharf London on 13th April, 2012 where the winners will be announced to national press coverage by The Rt. Hon Michael Portillo. If you make the final 10, not only will you be very close to a fantastic prize, you will have proved yourself to be amongst the best and most employable students in the country. Posted in Miscellaneous and tagged Undergraduate of the Year. Bookmark the permalink. 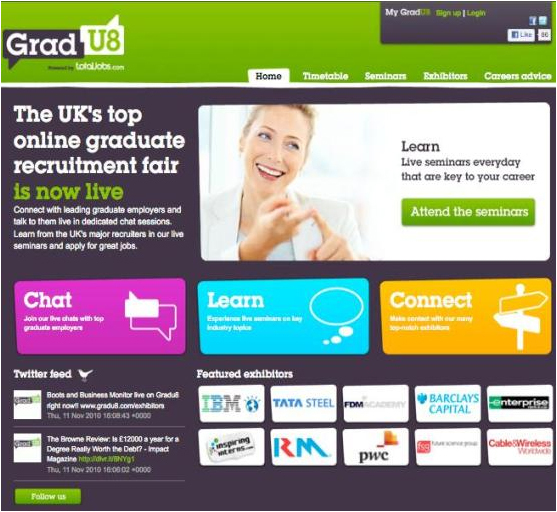 GradU8 is a free online event that gives you the chance to chat directly to employers, ask your questions about graduate schemes and work out which companies offer the career path that best suits you. Bringing jobseekers and recruiters together in a virtual meeting place, you can check out what graduate job opportunities are out there and even get noticed and kick start your career!